Simpro is a New Zealand company which develops specialised materials-handling solutions for waste management, food processing, and logistics. In addition to a wide range of bins, bin lifters, walkie stackers, pallet jacks, order pickers and goods lifts, Simpro is the original equipment manufacturer of international brands such as Dumpmaster and Quikstak, and offers a custom design and engineering service. Since 1986, Simpro products have been defined by intelligent design and an unconventional approach to solving materials-handling problems. They have built an enduring reputation for safety and reliability, and proved their worth in thousands of workplaces around the world. Simpro's head office and manufacturing facilities are in Auckland, but our products are sold through a global network of agents and distributors. To find a Simpro agent in your area see Where to Buy. Safely empty any bin, drum or cart weighing up to 250kg, at any height. 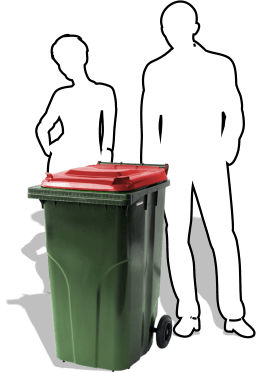 The classic mobile waste and recycling bin from Simpro.